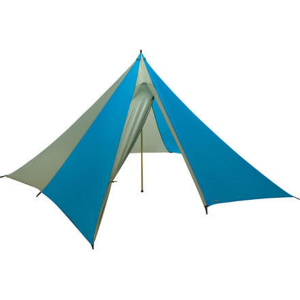 I've owned and used this tent for several years and it is very spacious for two people and reasonably light. In winter with snow banked on edges, it performs great. Without snow, in wind, a sleeping bag cover or bivvy is very helpful and is generally to be recommended in floorless tent. With two rigid poles, it's extremely stable. 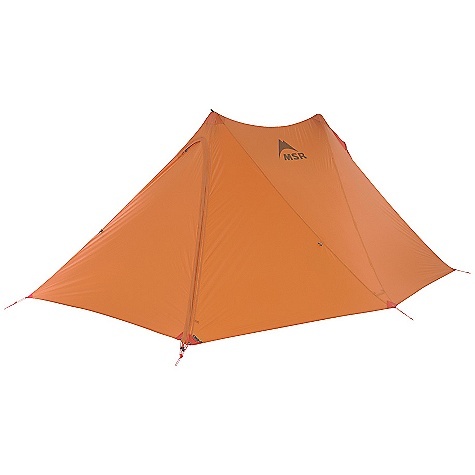 My version is made of coated nylon and is heavier than what is currently available. The question is how it compares with Betamid. I think it may be slightly larger, which is good. I'm not convinced the door design is superior. One doesn't have option, as with Betamid, of purchasing a bug and floor insert. 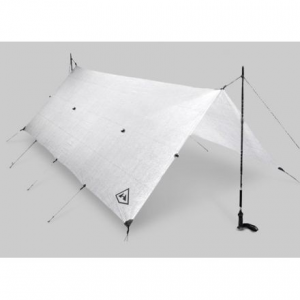 This tarp is an improvment on the clasic Black Diamond Betamid. Better door design and more space. I took this tent on a spring trip in Pikes National Forest and it took 40mi+ winds and 1 1/2 inches of hail then rain in one night. It had enough space for three guys and a dog to play dominos durring the storm. It is very spacious for two sleeping. If there is no wind there can be some condensation, but you can crack the top of the door to help. It is so big that your sleeping bag does not touch the sides where it can be damp. 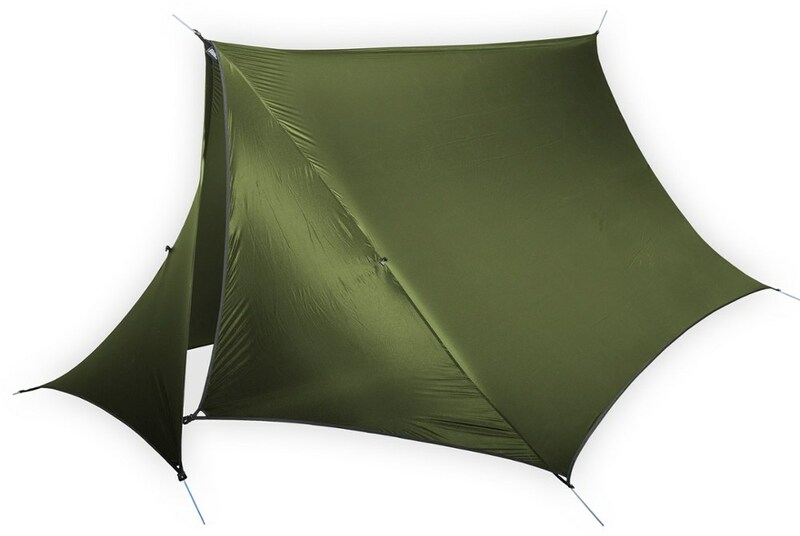 You can't go wrong for a 45sqft shelter under 2lbs. 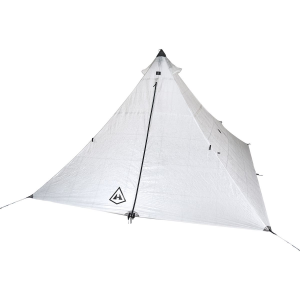 Well, I was looking for a very lightweight shelter, not necessarily a tent and not necessarliy a tarp. Being in the army I also wanted a lightweight application and the color had to blend in with the woods and it had to be compact and easy to use. The TwinPeaks met the citeria. It is vey lightweight and very compact when you store it in the bag it came with and the color was a brownish tan. In adition it has reflective material built in. It is just over the size of a Nalgene bottle when packed. Very easy to set up, I set it up in less than two or three minutes, didn't even have to read the instructions. The TwinPeaks is very roomy for two people and has more than enough space for one person and his/her equipment at over 5 ft in width and over 9 ft in lenth. The first time I used it was in December at Ft Campbell KY and the temp dropped to the twentys, no snow but lots of cold icy rain and biting wind. The tent stakes worked well in the hard groud. 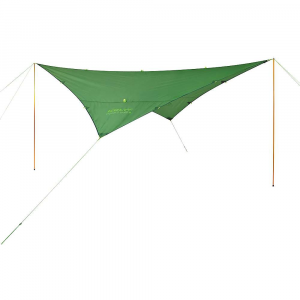 I used two lightweight poles to set it up, but if you don't have poles you can use bungee cords or paracord to set it up if you have trees nearby because it has loops built in for that so it is also multifuctional as far as setup goes, the area where you would put the poles up were also reinforced. The tent withstood the cold temps and the hard wind and was very quiet. I experienced hardly any condensation because you have no floor so air can escape through the bottom or through the built-in vent near the top or you could just leave the tent door open. I was very satisfied overall. The only drawback I had was that the pull cord on the zipper for the door ripped off somehow, easy fix though, I replaced all the pull tabs with 550 cord. I also thought the door zipper looked a little weak but it didnt break and I stretched the tent pretty good. I also waterpoofed the tent with some silicone type spray to add to the overall waterpoofness. In adition being the "what if?" type of person I am I threw in another set of stakes and bungee cord and some 550 cord and it all fit into the bag it came with. Overall it is very versatile and easy to use and strong enough for military use. The only recommendation I could possibly make to make it complete would be to add lightweight poles to the package and a repair kit and to also make a door at the other end. The TwinPeaks has been discontinued. The MSR TwinPeaks is not available from the stores we monitor. It was last seen January 21, 2011	at Moosejaw.